If you use a gas-burning stove, oven, fireplace, furnace, or any other kind of appliance in your home, you have a gas line to supply fuel for you. The same goes for commercial buildings. If you want to use any gas-burning appliances in your commercial building, you’re going to need a gas line. 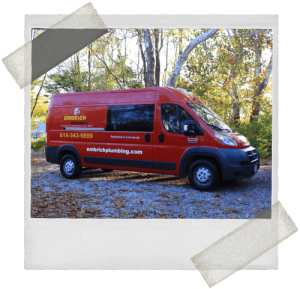 Embrich Plumbing Co offers a full range of gas piping services throughout Collinsville, IL. If you need a gas pipe installed, repaired, maintained, or replaced, we’re here for you. Call today to schedule an appointment with one of our expert technicians. We’ll make sure you get all the natural gas your building needs. Embrich Plumbing Co provides commercial gas piping services in Collinsville, IL and the surrounding areas. WHAT IS COMMERCIAL GAS PIPING? Natural gas is an excellent fuel. It’s cheap, plentiful, and generates a lot of heat compared to the amount burned. Unlike propane or oil, though, natural gas is never stored on–site. Instead, it’s piped into the building by the municipal gas company. No pipeline, no gas. So if you have a commercial building that needs access to natural gas, you’re going to need to hire someone to install it for you. Installing a commercial gas pipeline involves a complicated process by which the pipe is run from the nearest gas main to the building. Proper terminals and meters are installed, and from there the line can be run throughout the building to serve whatever appliances require it. Natural gas is extremely dangerous if mishandled. It is highly combustible, which is the whole reason that it’s such a popular fuel in the first place. Under the wrong circumstances, though, one minor mistake could result in severe injury or death for everyone in a wide radius of the incident. Handling natural gas is so dangerous that most cities have made it illegal to interact with the gas line unless you have proper training and permits. This is for the safety of all. So if you need to have a gas line installed or serviced, only trust people who can prove that they are certified to work with it. Gas piping services are both necessary and specialized. You will likely need gas piping services at one time or another for your commercial building. When that happens, give us a call. We can make sure that your commercial gas pipe is both safe and effective, able to serve all the natural gas needs of your building. Our professional technicians have many years of professional experience in installing and servicing natural gas lines. If you suspect that your natural gas line is having issues, don’t wait! Call us right away and we’ll repair it for you. We offer a full range of commercial gas piping services throughout Collinsville, IL.